WET DOG BOOK (2015). 144 pages of adorable, miserable soggy doggies, most of them never seen before! Click here for more info! FLOWER POWER ACTIVITY BOOK. Via 3rd party partner (Lulu.com). Ships worldwide. 2019 CALENDAR / ADULTS. Via 3rd party partner (Lulu.com). Ships worldwide. 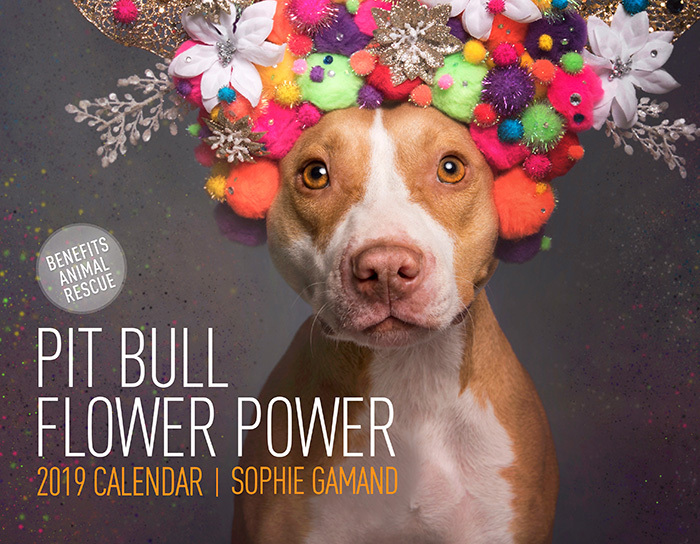 2019 CALENDAR / PUPPIES. Via 3rd party partner (Lulu.com). Ships worldwide. SMALL PRINT (up to 16x16in) are in open editions and can be ordered directly online for clients based in the U.S., Canada, UK and Europe. Various options are available (photo paper, canvas, framed canvas). More options can be discussed. SPECIAL PIT BULL FLOWER POWER design edition. A beautiful design statement, available via my RedBubble store. iCanvas COLLECTION: I have created a collection in partnership with iCanvas, which can be purchased via their online store and partners. These mostly include shelter portraits and wet dogs, as well as a couple of Pit Bull Flower Power montages. The prints are available as framed prints or canvases. They are ideal for shelters, veterinary practices, grooming salons, doggie daycare, and anywhere that is looking to brighten their walls with affordable options. PRINTS: OPEN EDITIONS Sizes up to 16x16". Not framed. Contact me for more info. 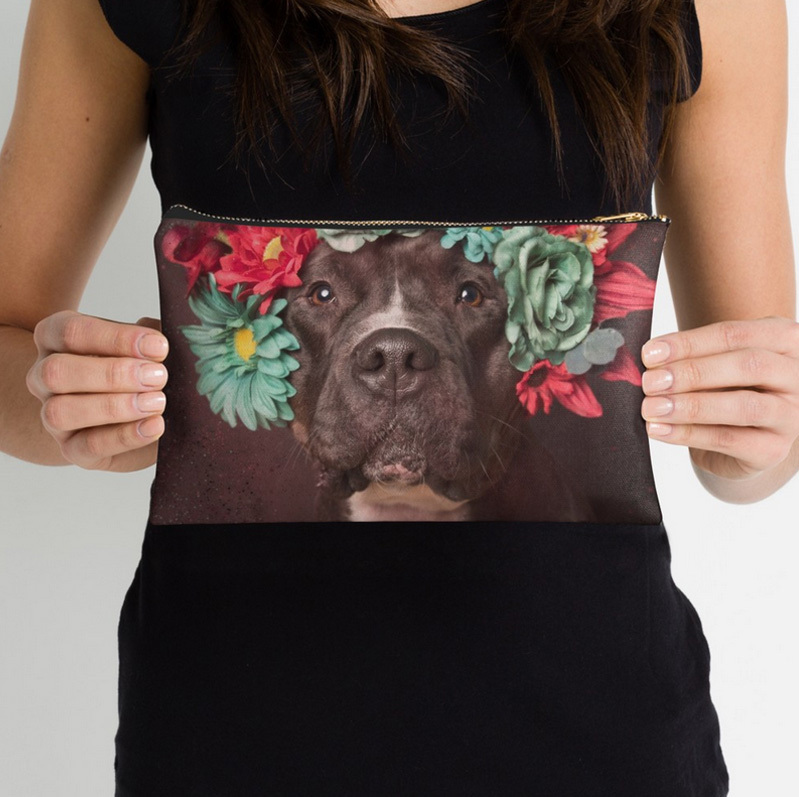 Via RedBubble (3rd party partner): PIT BULL FLOWER POWER DESIGN PRINT. Available in teal and pink. Many options to choose from: poster, canvas print, photo print, art board, framed print, metal print, and acrylic block. COLLECTOR’S PRINTS. Large, limited edition prints (start at 20x20"). Email me to discuss. iCanvas COLLECTION. Framed prints/canvas prints. Various sizes. Ideal for pet professionals (shelters, groomers, daycare, veterinarians). All these products are made-to-order and locally/ethically sourced to minimize negative impact on our environment. I carefully selected this partner and the range of products to ensure the highest quality and durability. PHONE SKINS AND CASES. Available for iPhones and Samsung Galaxy phones. Durable flexible case that grips around the edges of your phone. Shock absorbent TPU case with anti-fingerprint finish allows full access to device ports. Try Snap Cases for a lightweight hard case or Tough Cases for an extra durable option (my favorites!). Compatible with Qi-standard wireless charging. Shipped worldwide via RedBubble. STICKERS. This design is available in pink or teal and 4 sizes. Removable, individually die-cut vinyl. Ideal for smooth flat surfaces like laptops, journals, windows, etc. 1/8th of an inch white border around each design. Ships worldwide via RedBubble. TOTE BAGS. Many different designs and 3 sizes available. Selected design printed on both sides. 1 inch wide super strong cotton shoulder strap (14 inch length). Soft yet hard wearing 100% spun Polyester Poplin fabric. Dry or Spot Clean Only. Ships worldwide via RedBubble. SPIRAL NOTEBOOK (I personally use these everyday!). Choose ruled lines or graph. 6x8in. 120 pages. Cover 350gsm, paper stock 90gsm. Choose ruled or graph pages. Handy document pocket inside the back cover. Ships worldwide via RedBubble. STUDIO POUCHES. My favorite!! Perfect travel companion. Vibrant, high-quality double-sided prints that won’t fade. Durable 100% polyester canvas with a metal zipper. Fully lined for added strength. Various sizes perfect for holding coins, cards, phone, pencils, cosmetics. Cold machine wash and low tumble dry. Makes the perfect gift for family, friends, or yourself. Ships worldwide via RedBubble. HARDCOVER JOURNAL. 5.2x7.3in.. 128 pages. 90gsm paper stock. Wrap around hardback cover. Fully printed design on the front and back. Available in a selection of ruled, graph or blank pages. Shipped worldwide via RedBubble. THROW PILLOWS. Many different designs and sizes available. Vibrant double-sided print throw pillows to update any room. Soft and durable 100% Spun Polyester cover with an optional Polyester fill/insert. Concealed zip opening for a clean look and easy care. Ships worldwide via RedBubble. GREETING CARDS / POSTCARDS. 3 models (4x6 postcards or greeting cards, 5x7.5 greeting cards). Digitally printed cards on heavyweight stock. Uncoated blank interior/reverse provides a superior writing surface. Greeting card comes with a kraft envelope for mailing or gifting. Ships worldwide via RedBubble. MUGS and TRAVEL MUGS. 3 models (standard, tall with a V shape, and travel size). Feature wraparound prints. Dishwasher safe. Mugs are made from Ceramic, travel mugs feature insulated stainless steel with removable lid. Ships worldwide via RedBubble. CHIFFON TOPS. Front panel is edge-to-edge custom printed just for you. Sublimation transfer print technique embeds dye into the fabric allowing it to stay soft and drapey. Option of black or white back panel, sleeves and binding. Slightly sheer. 100% Polyester chiffon with silky handfeel, ideal for wearing as a layering piece with your faithful cami or bralette. Loose cropped boxy style fit. Sizes run small. Shipped worldwide via RedBubble. KIDS T-SHIRTS AND BABY CLOTHES. Only available with this special Pit Bull Flower Power design, in pink or teal. Ethically sourced. Made to order and shipped worldwide via RedBubble. DRAWSTRING BAG. Made from 100% polyester woven fabric. Includes zipped pockets. Wide, soft drawcord that’s easy on your shoulders. Durable quality metal grommet. Long-lasting printed design on both front and back. Ships worldwide via RedBubble. CONTRAST TANK. Slightly sheer 100% polyester chiffon front panel with silky handfeel. Option of black or white 96% polyester, 4% elastane soft jersey back panel. Front panel is sublimation printed allowing fabric to stay soft and drapey. Loose flowy fit (sizes run small). Garment fully constructed and printed in the USA. Shipped worldwide via RedBubble. WALL CLOCK. Customizable (even the hands' color!). 10.25x2in. Modern printed polypropylene face without plexiglass. Bamboo wood frame with natural finish or painted black or white. 4 customisable metal hand colours to choose from. Quartz clock mechanism (AA battery not included). Built-in hook at back for easy hanging. Ships worldwide via RedBubble. DRESSES. 2 models available: Try A-line dress for a loose swing shape and an easy, flowy fit; or a Graphic T-shirt Dress for a loose casual fit. Made in the USA. Shipped worldwide via RedBubble. A-line dress: Print covers entire front and back panel. 97% polyester, 3% elastane woven dress fabric with silky handfeel. Graphic T-shirt dress: Sublimation printed 96% polyester, 4% elastane front panel. Solid color 100% cotton back/sleeves/rib. iPad COVERS. One-piece, clip-on protective case that’s slim and lightweight. Impact-resistant polycarbonate shell allows full access to device ports. Super-bright colors embedded directly into the case. Design wraps around sides of the case. Minimal impact on overall device size (for extra protection, try Tough Cases). Shipped worldwide via RedBubble. Shop a large variety of products featuring my photos. From notebooks to tote bags, zipped pouches, pillows, clothing, mugs, wall clock… Find a perfect gift or treat yourself! 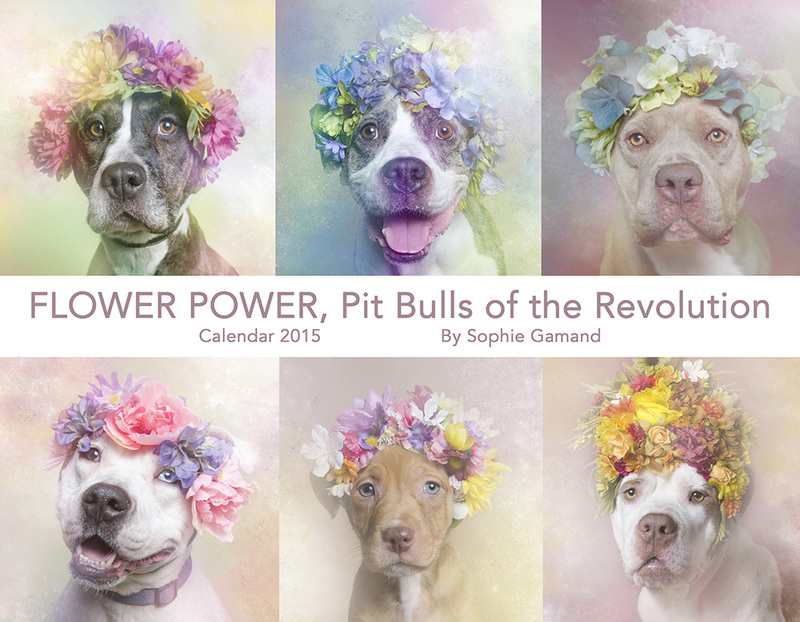 PIT BULL FLOWER POWER design special edition. Clothing (incl. 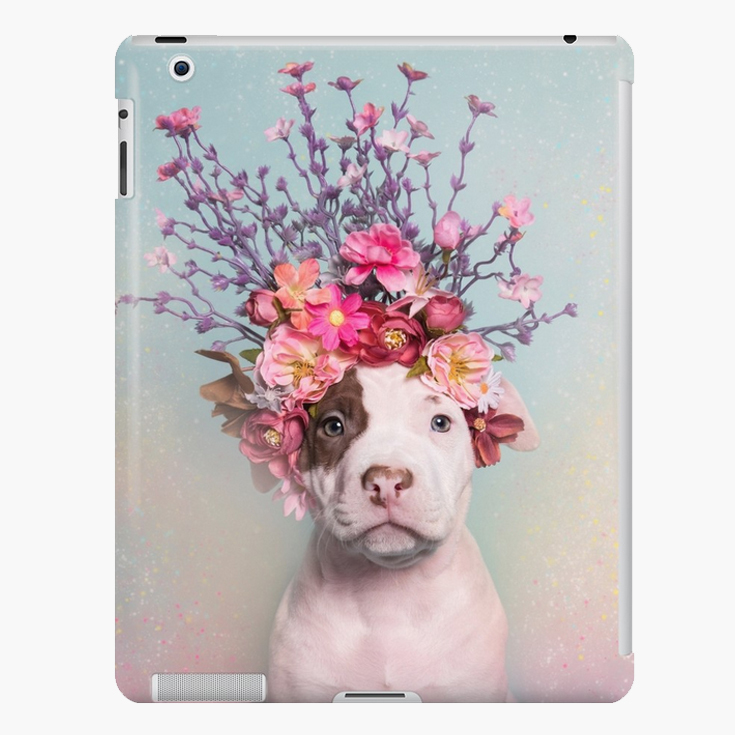 T-shirts, hoodies, baby clothes), prints, cards, phone cases, stickers, and many products featuring a pink or a teal version of this adorable Pit Bull Flower Power design. Ships worldwide via RedBubble.